Pork Tenderloin with Sweet and Sour Cabbage, Thyme for Cooking main course. Pork and cabbage are a very traditional pairing. 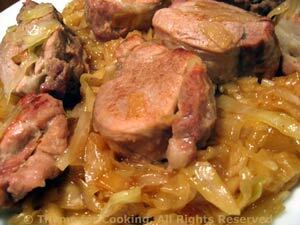 I've updated it a bit, using pork tenderloin and braising the cabbage for only a short period, leaving just a hint of crunch, closer to a warm salad. Cut pork into 1" (2.5cm) slices. Shred cabbage by cutting slice off of head, lay the slice cut side down and cut into 4ths, then, cutting across, slice 1/8 inch thick. Do not use the core of the cabbage - you'll recognize it when you see it. Move onion to the side and add pork, browning quickly, about 3 minutes per side. Remove pork and add vinegar, sugar and chicken stock. Stir well. Add cabbage and stir to combine. Put pork slices on top, cover and bring to a boil. Reduce heat, cover and simmer for 15 minutes, until cabbage is tender. Uncover, increase heat. Remove pork to small platter. Stir cornstarch mixture into cabbage to thicken. Spoon around pork and serve.